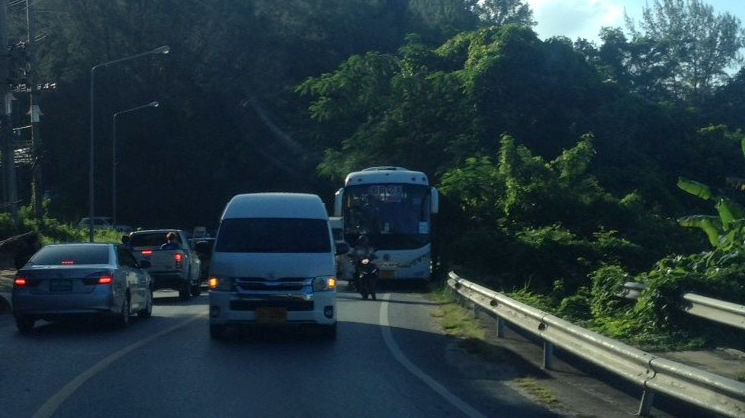 PHUKET: Kamala Police today confirmed that there were no injuries after a pickup truck collided with a tour bus heading in the opposite direction on a tight curve overlooking Laem Singh on Phuket’s east coast road. 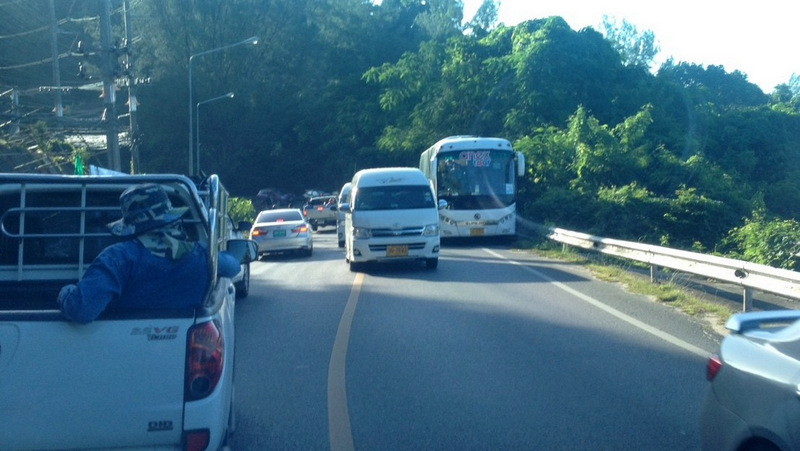 The accident occurred at about 8am yesterday (Jan 8), Capt Jarat Laemphan of the Kamala Police told The Phuket News today. 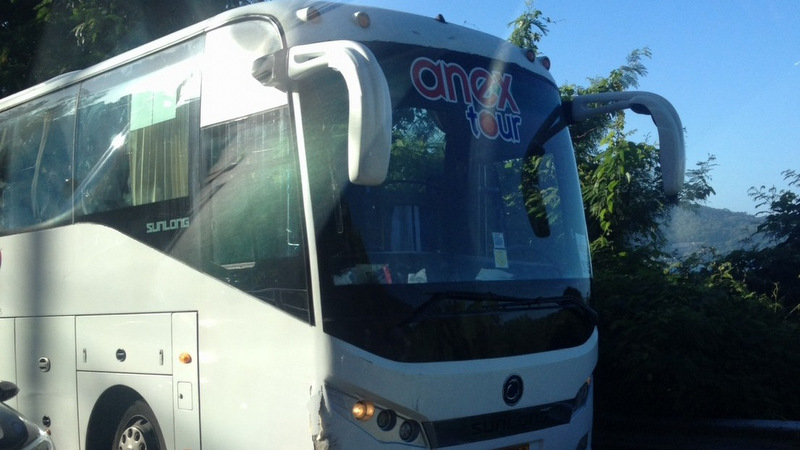 The bus, operating for Anex Tours, had picked up its Russian passengers in Kamala and was en route to Phang Nga when the accident happened, Capt Jarat explained. The pickup truck was travelling southbound along the road when the bus and pickup collided, he said. “The bus struck the pickup at the rear-right wheel,” Capt Jarat explained. The collision was heavy enough to force the tyre to blow out, he added. “The pickup driver was lucky, and he managed to pull over by the side of the road without hitting any other vehicles,” Capt Jarat said. Of concern is that only metres beyond the guardrail on the coastal side of the road is a sheer drop to the water below. 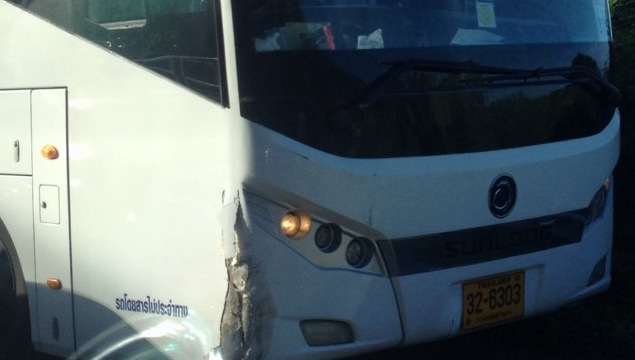 The tourists on the bus were frightened by the accident, but otherwise all well, he added. Workers took about an hour to clear debris and remove the stricken vehicles, which caused traffic delays along the busy road, Capt Jarat explained. Capt Jarat today also said that he had yet to determine who – if anyone – would face charges over the accident. “Tomorrow (Jan 10), both the pickup driver and tour bus driver will come to talk with me to clear the cost of damages together,” Capt Jarat said. Meanwhile, he urged all motorists to be careful along that stretch of the coastal road. “It can be dangerous as there are many curves,” he said. I am sure that Captain not expect any thai to follow his wise advice. But he hasdone his verbal duty and can rest, until next 'speedy accident'.